I was not disappointed. Fields of Glory depicts the campaign under Edward III starting less than a decade into the Hundred Years War, and the lead-up to the Battle of Crécy. This was not a phase of history I had studied in any detail and my prior knowledge went about as far as knowing of the battle and that the young Edward, The Black Prince, showed great courage and skill as a general despite his tender years. 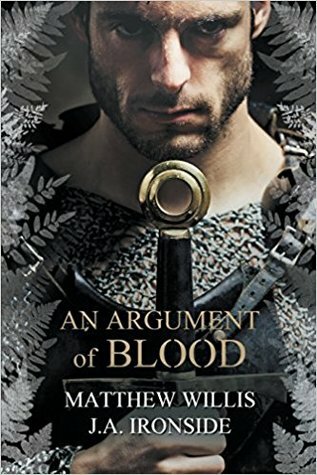 This lack of knowledge was no hindrance as Jecks draws the reader expertly into the world of 14th Century France and the invading English and Welsh army. The narrative eschews the more common approach of taking one main character (e.g. Bernard Cornwell’s The Last Kingdom series, C.S. Forester’s Hornblower series) or two (Patrick O’Brian’s Aubrey-Maturin series, Simon Scarrow’s Cato-Macro series), for a broader spread of POVs, mostly in the English army but including a French civilian woman Béatrice, whose fate converges with that of the army. It put me in mind of Alaric Bond’s Fighting Sail books, where the story is told from the perspectives of a range of characters involved in the narrative, some of whom stay the same from book to book, while others drift in or out. Central is Berenger Fripper, the head of a Vintaine (nominally a 20-man unit as the name suggests but often less for one reason or another), though numerous others provide similarly prominent point-of-view, such as Sir John de Sully, the knight under which the Vintaine fights, and the aforementioned Béatrice among several non-combatants. Particularly intriguing is the ‘gynour,’ Archibald, responsible for the primitive cannon and its unstable black powder, potentially as dangerous to the English as to the enemy. One thing that becomes apparent very soon is that the title is distinctly ironic. Precious little is glorious. The nature of mediaeval warfare can seem counter-intuitive to those more accustomed to reading about modern combat, but Jecks immediately establishes the conventions – the defending army would often attempt to avoid battle, generally having far more to lose from a decisive engagement. The invading army therefore has to goad the opposing general into fighting. The means by which this was done was the chevauchée – a ravaging of the land and common folk creating as much destruction and slaughter as possible until the French king had no choice but to deal with the annoyance. If anyone starts to read Fields of Glory with any remaining notions of the chivalry of mediaeval knighthood, it will not last far into the narrative. (In any case, chivalry, where it was observed, tended to be practised between those of the noble classes, not by knights toward commoners…) The brutal actions of the invading army are not shied away from, neither are they gratuitous. One of the most interesting aspects of the book for me was the way Jecks dealt with monstrous cruelty being a fact of life in this style of warfare, but which still had to be carried out by men with agency. Consciences are not a modern invention, after all. The range of responses within the invading army to its own depredations are fascinating. They range from those who view the army’s behaviour with mounting disgust to those who surrender themselves completely to the brutality, by way of some who are momentarily swept up by mob mentality or disinhibited by alcohol. It is, in short, a convincing cross-section of attitudes one might expect to find. Possibly the most convincing aspect, though, is the way characters project their feelings about the actions of the army into the superstitious and religious. These are not modern men, and the alien nature of their willingness to leap to supernatural explanations when things start to go wrong feels spot on. As the army’s initial success turns to difficulty and then the very real prospect of being routed by the resurgent French, some begin to believe firmly that God is displeased or some other force, as real to them as it is unseen, plagues them, and begins to be dangerous for those who might take the blame for bringing it on. The particular skills of the vintaine and their shortcomings are similarly presented with a good eye for the period detail. Touches such as the problems caused by a wet bowstring or a knot in the stave of a bow, and the preoccupation of the characters in such matters, demonstrate the level of research and help to put the reader firmly in the 12th century. Pleasingly, Jecks avoids the great potential pitfall of historical fiction, of characters being too modern for the their time. The outsiders who allow us to see the world of the Plantagenet army with fresh eyes, chiefly Béatrice and the vintaine’s boy servant, Ed, are just as much of their time as the soldiers. Each of the characters has their own arc bound up in the wider story of the invasion, some of which seem set to continue into the following books. Much of the narrative turns on attempts by one side or the other to avoid a pitched battle, but the climactic fight, when it arrives, maintains the tension throughout – even though most readers will know broadly how it ends. Fields of Glory is highly recommended to fans of historical military fiction, and I look forward to reading the succeeding books in the series.